Name one aspect of working on Corvettes which intimidates many DIYs and, often, the response will be: wiring and most things electrical. To some, if it's not mechanical; it's unfamiliar territory. Electrons are invisible and seemingly unpredictable, uncontrollable and unfathomable to the untrained Corvette DIY. 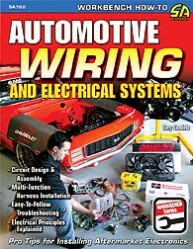 The Vette hobby needs good books on automotive electrical theory and practice which are written specifically for DIYs. That need is fulfilled by Tony Candela's Automotive Wiring and Electrical Systems. With this book, finally...there is a DIY's reference which helps solve the mysteries of and eliminate the misunderstandings about the repair, diagnosis and modification of automotive electrical systems. The book covers a wide range of subjectsâ€“everything from elementary electrical theory to a subject as advanced as constructing a wiring harness from scratch. Some of the best content in the book covers: how to properly use a digital multi meter (DMM), wiring fundamentals and troubleshooting. Author Candela's unique writing style combines a comfortable informality with his vast knowledge of automotive electrical subjects and a DIY enthusiast's perspective. That mix works extremely well in this title. Add to that excellent imagery and outstanding reproduction and you have a book that is as nice to look at as it is to read. If you're a beginning or intermediate Corvette DIY looking for a book which will demystify your car's electrical system, Automotive Wiring and Electrical Systems should be on your short list of titles to buy.